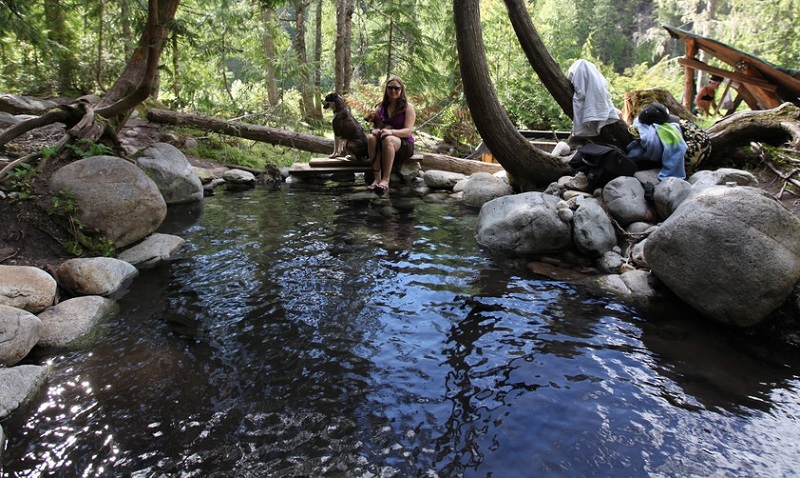 Halfway Hot Springs is the ideal getaway for those looking for more of a wilderness setting and not a resort. The location is rather a challenge to get too because it is down a logging road, but with the right maps or information below once you find the natural springs, you will see why it is worth the trip. There are several sections to Halfway River Springs, including some back country sections, a secret thermal pool, and even camping if you plan on staying overnight. Much of the area is underdeveloped allowing you take in the beauty of mother nature. There is a changing area once you arrive and even a few bathrooms around the area. Other than that it’s just you and the wilderness. 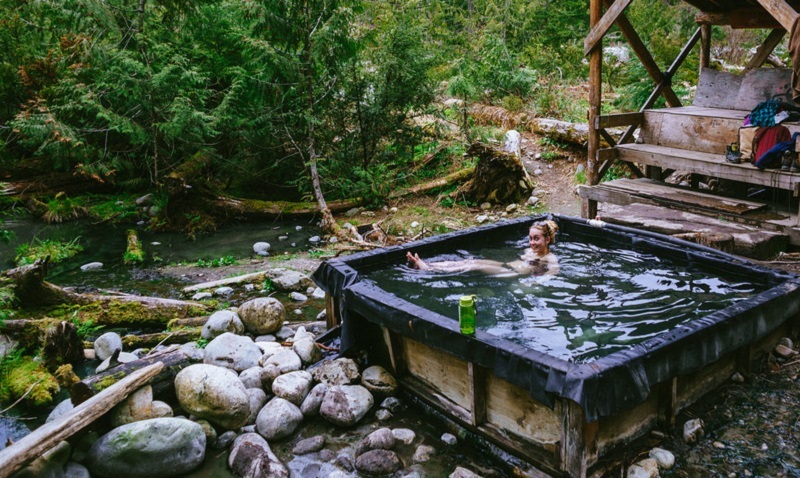 The reason for Halfway Hot Springs is that is is directly in between Revelstoke and Nakusp. Along the river, several section start bubbling up for people to take a rejuvenating soak. You can even move some rocks around to determine the level of heat you are most comfortable with. BC parks has done a great job developing the area while keeping it rather primitive. There are 12 campsites that allow for vehicle parking and 10 additional that are spread throughout the area and ideal for those who want to pitch a tent. Each site comes with fire pits and picnic tables for use. Because this is primitive camping, you will want to pack rather lightly and bring your own firewood. It’s also first come, first serve so make sure you arrive early to get a good spot as they can fill up fast. Directions from Kelowna – be sure you have a reliable odometer as the backrounds can be rather confusing and it’s important to know how far you go in each step. 2. You will start driving North towards Revelstoke on 6th avenue which will turn into Highway 6, Canyon Road North. Stay on this road for 25.42 kilometers (15.79 Miles). 3. Once you have driven 25.42 kilometers you will come to a bridge. The turnoff to get to Halfway Hot Springs is the turnoff before the bridge. If you take the 2nd turnoff after the bridge you will be on the wrong road. 4. Stay on this dirt road for 11 kilometers (6.83 Miles). If coming from Revelstoke you can go south on Highway 6 until you come to the bridge and follow the same directions from there. In this case though you would take the turnoff after the bridge instead of before it. 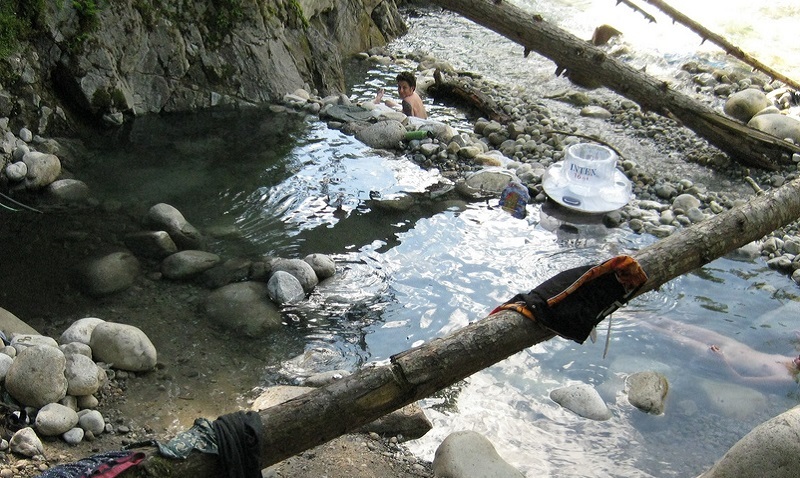 If you thought getting to Halfway Hot Springs was difficult, you can become even more adventurous and go for the upper section. If you can find them, you will enjoy soaking in natural waters on the mountain side with beautiful views under the stars. It’s fairly dangerous to get too and you can even get turned around and off the path, but it’s one of only a handful of natural hot springs left that aren’t commercialized. For more information on Halfway Hot Springs you can visit there site here.